Choy Sum is the Cantonese pronunciation of the characters, 菜心 (càixīn in Mandarin), which translate as ‘vegetable heart’. The name is not reserved for a particular vegetable, however, but can refer to several types of greens, especially the tender ‘heart’ of Bok Choy once the tougher, outer leaves are removed. Other green vegetables sometimes appear as ‘Choy Sum’ but Gai Lan appears this way more commonly than it does its by its own name. Indeed, when I purchased the bunch you see pictured above, that is how it was identified on the store label. The Chinese name for the vegetable, 芥蘭, is properly pronounced ‘jièlán’ in Mandarin, but the Cantonese pronunciation ‘Gai Lan’ seems to be becoming more popular outside of Guangdong province (Canton), even in China. 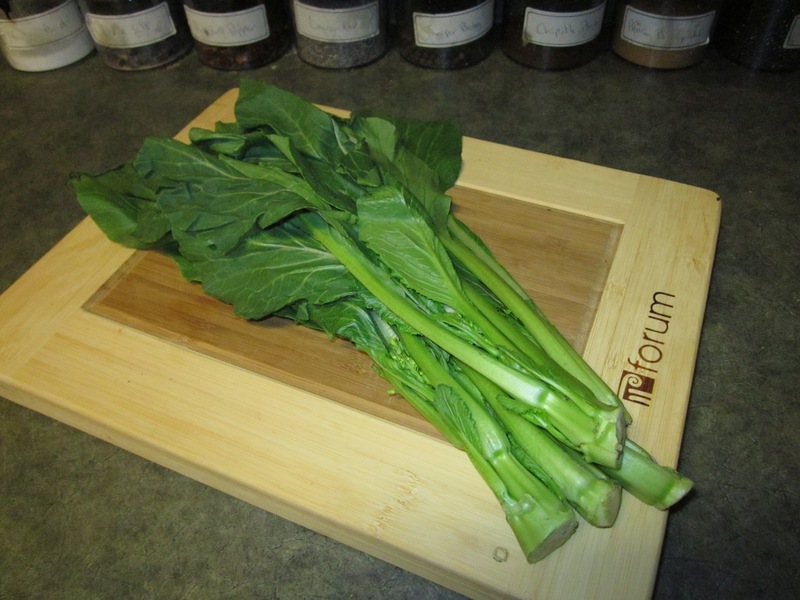 In western stores, the name ‘Gai Lan’ (or alternatively ‘Choy Sum’) appears with ever increasing frequency but it is also still sometimes referred to as ‘Chinese Broccoli’. As a matter of fact, the ‘Beef with Broccoli and Oyster Sauce’ that is so ubiquitous on westernized Chinese restaurant menus also has its counterpart in China using Gai Lan where it appears as ‘芥蘭牛肉’. 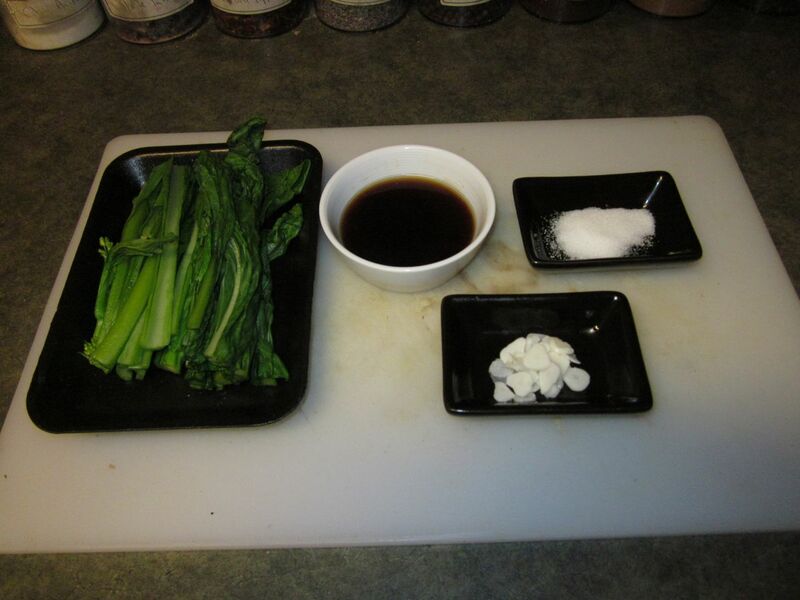 To blanch the Gai Lan, you can use the method I use for the Bok Choy recipe in my earlier post (omitting the baking soda, if desired). Blanching is not strictly necessary but it tenderizes the stalks nicely and reduces the amount of flash-frying time so that you don’t risk over cooking the leaves or introducing bitter tastes. Heat your wok to high and add a splash of vegetable oil. 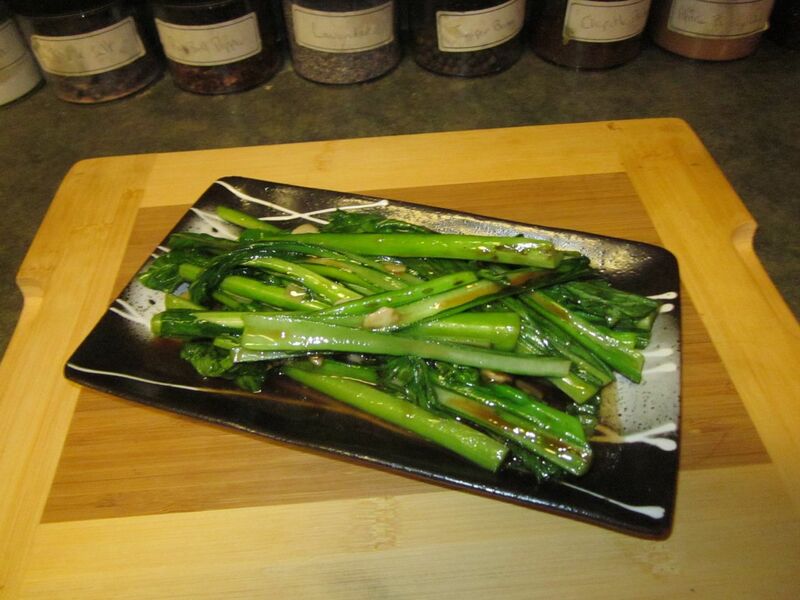 As soon as the oil starts to smoke, add the stalk portions of the Gai Lan and stir-fry just until a few brown spots start to appear and then add the leafier portions and the garlic. As soon as the garlic is soft, throw in the sugar, then the oyster sauce blend and keep tossing until the liquid is reduced by about half. Plate and serve. From “The Wife”: The way my husband cooks this is EXCELLENT. I love this vegetable and have had it many times in chinese restaurants. His is easily the best I’ve ever had. how much oyster sauce? Or oyster blend? How much? Good recipe but what’s with all the sugar?